[ARCHIVED THREAD] - Can I buy an SBR and convert back to legal length without NFA transfer? I found a milled Yugo M92 SBR. I was wondering, if I had it sent to my FFL, could I have the FFL's in house gunsmith blind pin a barrel extension on and transfer it to me as a regular long gun? ETA: Seller refuses to blind pin an extension for me. I was told it'd be $200 to transfer from seller's FFL to mine, then another $200 if I wanted to F4 it to me. Is this true? Is it out of state? If so, it's a $200 transfer from owner to dealer in your state, and another $200 from that dealer to you. There's no need for the owner to transfer it to "his FFL" first. If he's in state, it would be one $200 transfer to you. Don't see why you couldn't do the one transfer to your FFL and have them concert it to non-SBR before selling it to you as a non-NFA item. Once an item is out of NFA configuration, it's no longer regulated as such. I think that it could be transferred to you with the extension on there like a regular long gun. But to remove that extension, you'd have to file a form 1. That's correct. The issue is it sounds like the current owner won't do the extension first. May I ask a stupid newbie question? What makes the Yugo M92 SBR worth the extra hassle involved? No longer imported or something? Insanely good price that makes up for the transfer taxes? Unless the item is rare or a crazy good price, it sounds like you should just walk away. Seller doesn't want to un-SBR it you don't wanna pay for two transfers. It's not rare, nor is it highly sought after because they started importing these guns as pistols for I think 3 years now. This particular gun was built on a virgin parts kit ($800-1000 value) on a rewelded milled receiver ($500ish) and has never been fired. 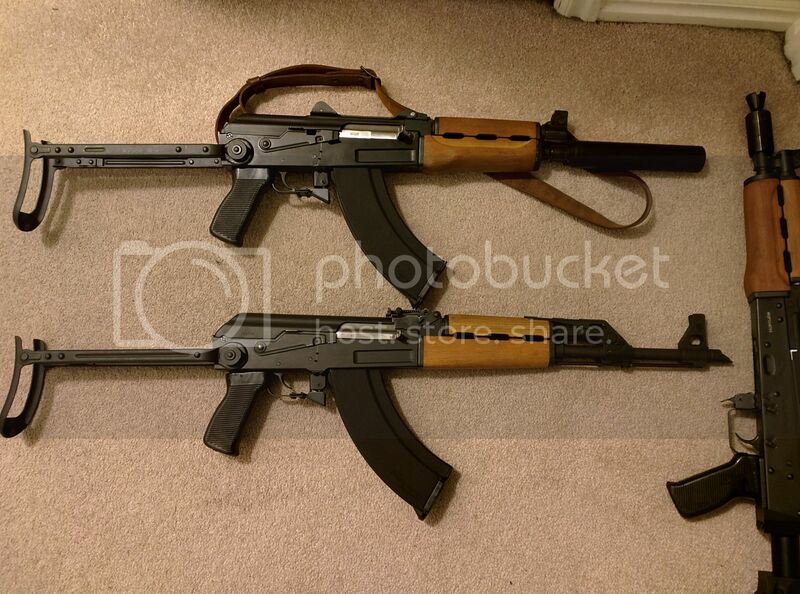 Guy wants to trade me for $300 + a firearm receiver I bought for $174 in 2009 (IDK current value). The price is right, but if I can't get away from tax stamps, then the price might not be so great. No it is not true. He can send it to the gunsmith tax free so your FFL can pin the extension on it. The it is Title I and can be xferred to you. Didn't think about it that way. If he was transferring it to FFL, it would be the F4 transfer. If he's sending it to gunsmith for work, no transfer is taking place. Does it matter that the gunsmith is in a different state? Sweet Jesus, you just saved me $200! Looks like you owe RenegadeX a bottle of whisky. No thanks, last time I was offered a gift I was banned as moderator. Next time, it might be a pemaban!